Another fun play date with my gal Deb. She bought these fabulous dies by Elizabeth Craft Designs and we just had to play with them today!!! The first one is poles with little banner hanging. Too cute! The second one is a park bench and I have to say, I liked making both but my fav is the park bench. We did manage to get a couple other cards made as well but I didn't get pix of them. Below is my happy buddy, Seamus Bobby MaGee. 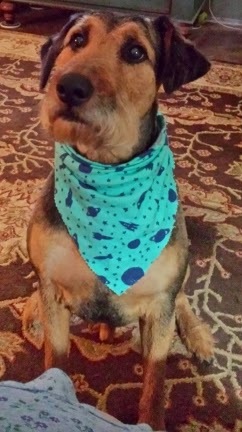 He had just gotten back from the groomers and was looking too handsome NOT to share. Great cards love the designs when are they in the UK?